Join us for Purposeful Prayer on Select Tuesdays! 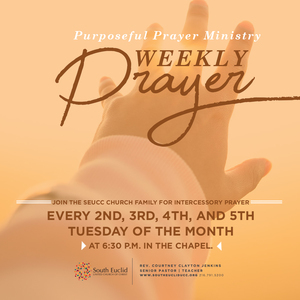 Purposeful Prayer (Intercessory Prayer): Tuesdays, April 16, April 23 & April 30 at 6:30 p.m. - Join the SEUCC church family in a time of intercessory prayer each 2nd, 3rd, 4th, and 5th Tuesday at 6:30 p.m. in the Chapel. If you believe in the power of prayer, want to learn how to pray, like being around people praying or need special prayer, come to Purposeful Prayer. Prayers are offered on behalf of the church, community and world! If you have questions, contact Vivia Turner or Rev. Carla Jo Howlett (revcjhowlett@southeucliducc.org).